The Kimball Art Center on Monday made public reworked designs for its expansion, opting for a scaled-backed concept by a renowned European architect more than a year after an original idea was widely criticized as something that does not fit along Main Street. During an event at the art center, leaders of the not-for-profit said the original design was discarded as the architectural firm Bjarke Ingels Group devised a new concept. The firm, with offices in New York City and Copenhagen, Denmark, worked up to five months on the new design, the Kimball Art Center said, noting that approximately 50 designs were considered over that period. The Kimball Art Center said early feedback from City Hall, the organization’s board of directors and some architects has been positive. "This is an exciting step forward," Robin Marrouche, the executive director of the Kimball Art Center, said at the Monday event. 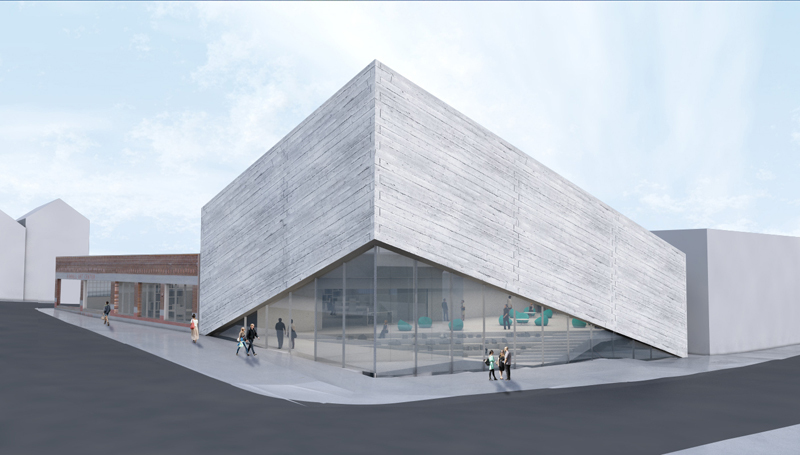 The reworked expansion plans envision a 15,000-square-foot concrete addition to the Kimball Art Center on the plaza at the intersection of Main Street and Heber Avenue. It would range in height from 32 feet tall to 46 feet tall with a sloping design. One story would be subterranean. The original design — stacked railroad trestles climbing to a height of approximately 80 feet — was one of the sticking points with critics at that time. "The other one was not going to work for the town," said Matt Mullin, the chairman of the Kimball Art Center’s board of directors. A 15,000-square-foot addition would double the Kimball Art Center’s space. The organization wants the expanded square footage for exhibitions and programs. There would be 9,000 square feet more museum and exhibition space, more space for administrative offices and social areas, the Kimball Art Center said. There would also be what is described as a Children’s Interactive Discovery Center covering 4,000 square feet and 3,000 square feet for an education studio. The addition would shift the front door of the Kimball Art Center from the intersection of Park Avenue and Heber Avenue to the Main Street-Heber Avenue intersection, a spot that has much more foot traffic than the current location of the front door. The existing Kimball Art Center building would be connected to the new one on both stories of the old building. The reworked design will allow the Kimball Art Center to avoid what could have been a difficult City Hall process. The taller design forced the organization into a hotly contested zoning process. The design up to 46 feet tall now under consideration does not require the same City Hall process. Mullin said he anticipates the City Hall process will take 90 days. The Kimball Art Center must convince City Hall that the designs meet Old Town’s tight design guidelines. That is typically a less involved process than the one that the organization went through earlier, prior to scrapping the original design. "We’re highly confident it’s got a good chance of being approved," Marrouche said. Elliott Work Group, a Park City-based architectural firm, has been drafted as the local architect to work with Bjarke Ingels Group. Elliott Work Group has extensive experience designing Main Street buildings. City Hall received the application from the Kimball Art Center on Monday. Anya Grahn, the historic preservation planner for the municipal government, said she anticipated starting the review of the application by the end of the week. The Kimball Art Center, meanwhile, is also searching for a second location for educational programs. The evaluation process has just started and officials were not sure where the second location would be situated. The organization wants the second location to offer better parking and access as well as the flexibility to grow, the Kimball Art Center said. Marrouche said a fundraising campaign is planned to start in the summer. The Kimball Art Center on Monday indicated a price tag is not yet known. In an email interview, Bjarke Ingels said his architectural firm "worked with Kimball long and hard to find a way to create a constructive dialog with the city." "Once it became clear that we needed to stay within the existing regulations we simply had no other alternative than to take a step back and deal with the new situation. Kimball — and we — did the only thing possible – and now I think we have arrived at a design that can be just as striking a contribution to Part City’s streetscape — if only a lot more intimate in scale than our first sketches," he said. Read The Park Record’s complete Q&A with architect Blake Ingels here.